5-Star Luxury RV Resort Living in Bradenton, Florida. Horseshoe Cove RV Resort more than earns its reputation as the highest-rated RV park in Bradenton, FL. Set in a picturesque oak grove along the Braden River, our Florida RV resort provides residents with a 12-acre private island park and lighted fishing pier as well as stunning nature trails and a dog walk for pet-owners. 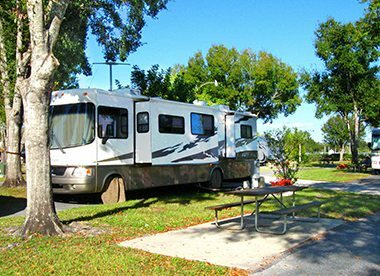 Those RVing in Florida will appreciate our over 470 grassy sites featuring full-hookups, concrete pads and private picnic tables. We also offer Florida vacation rentals and resident home sales. Each of our RV sites provides the perfect combination of comfort and convenience to make your stay at Horseshoe Cove a memorable one. Horseshoe Cove is your home away from home. We offer RV park model rentals with all the amenities you need for a comfortable, enjoyable stay. Make Horseshoe Cove your permanent vacation destination. We offer a variety of comfortable vacation homes to choose from. Looking for things to do and places to visit near Bradenton? Check out these great local attractions and more!